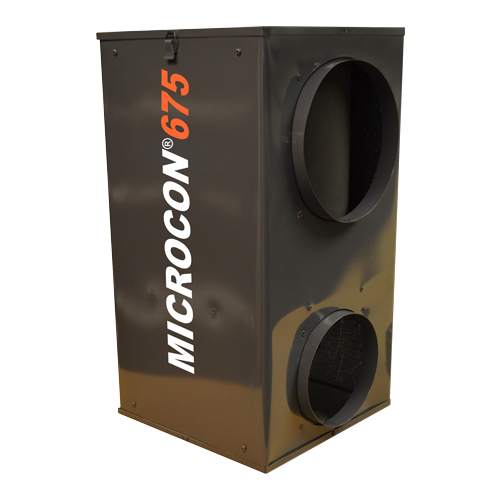 The Microcon® 675 ‘whole home’ HEPA Air Filtration system is easily installed in your home’s HVAC or air handling system to provide 99.97% airborne particulate reduction without impacting air flow, static pressure or unit sizing. This whisper quiet air filtration system is extremely efficient for dust, pet dander, pollen and VOC removal. This unit is recommended for areas up to 5,000 sq ft.
14.5”W x 27.5”H 5,000sq ft. 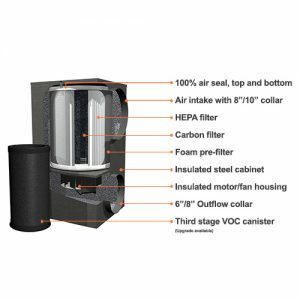 The Microcon® whole home HEPA filter can be installed into any existing commercial or residential HVAC system to provide 99.97% airborne particulate reduction without impacting air flow, static pressure or unit sizing. Installation requires no costly electrical or mechanical alternations to the HVAC system and the unique design offers HEPA grade filtration with very low power consumption. The 3-stage filtration cartridge is contained and protected in a durable steel box. In stage-one, a foam pre-filter captures large particulate matter. In the second stage, the HEPA filter traps more of the harmful and irritating particulate. Finally, in the third stage, the activated carbon absorbs chemical or gas-based pollutants. The filters are easy to access and change. Once locked into place, the filter is completely sealed, ensuring that no polluted air escapes from the box. The baked thermostat powder finish on the box itself provides a durable, long-lasting housing that will not off-gas chemicals, providing truly clean air to the surrounding environment. Though continuous operation is recommended for optimal indoor air quality, this unit does feature an illuminated on/off switch. There is an optional VOC filter upgrade available for this unit. • Hotels, motels, and resorts.